Welcome to the Coding Club website for 2015-2016! The students will be meeting once a week for 8 weeks. During that time they will be coding a digital robot, coding a robot, moving around droids online, and even creating their own game! The purpose of this club is to teach students to think like coders, to give them an opportunity to play and have fun, and to let them share their games with people around them. At the end of the club, students will showcase their learning for the entire school as they open up an arcade for all students! Please scroll down to see the lessons in advance, or to repeat them at home or in the Learning Commons during your free time! Have you played Lightbot on the iPad? To begin, pull out an iPad and start it up. Go to World 1, Level 1, and see how far you can make it! If you aren't working with a fellow coder, you probably won't make too far. Will you work alone, or will you problem-solve with others?? At the end of the lesson, you will have an opportunity to code a friend. We know, it sounds silly! Using the same language as Lightbot, you will create a course and see if you can navigate a friend through your maze... Be ready, because next day you will have to program each other to get from A to B in the most efficient way possible! Want to try at home? 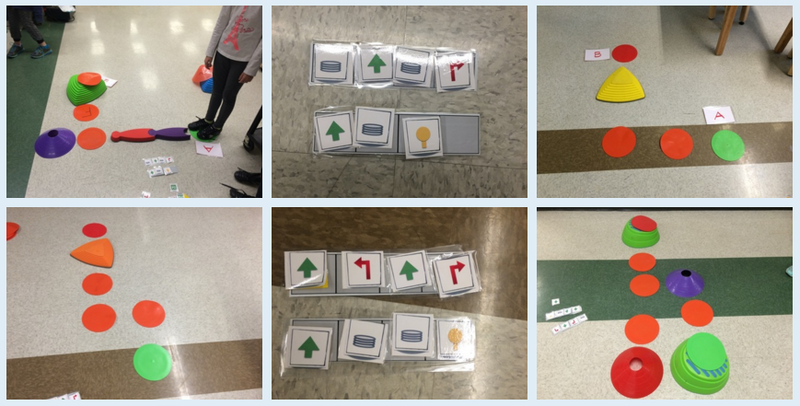 Have your parents follow this link and print out the coding cards. Can you teach them how to play? Yes, teachers love alliteration... Today you are going to make your very own course that will be solved by all of the other coders in the group! What will your course look like? Can it be solved in 8 commands? Or will you and a partner challenge yourselves to create a 10 command course? Will you be able to program each other to navigate through the other courses? Lesson 4: Angry Birds - Catch the Pig! Can you make it to level 12? Find a way to code that bird to catch the pig... Birds can fly, so it sounds easy right? WRONG! 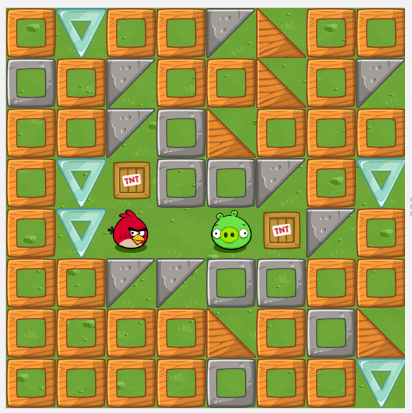 You'll have to navigate that bird through a maze with your programs so that it can catch the pig... Good luck! Lesson 5: Fill the Canvas! Can you fill the canvas with beautiful art? Control and direct your artist to create the pictures they ask for... You may get a bit stuck on the angles - if that's the case, check out the picture below. If you really want to go crazy and learn a ton about angles, check out this video by Khan Academy! Click here to get started on your challenges for this week. What?? Just play? ... YES! Follow this link. Would you like to complete the Starwars challenges? Frozen? Minecraft? It's completely up to you. Lesson 7: Build an App! Lesson 8: Finish your App! Lesson 9: Preparing for our Arcade! Tune-in to this site after our arcade is completely finished... We'll have pictures of kids working hard, photos of our stations, and reflections from the coding crew!